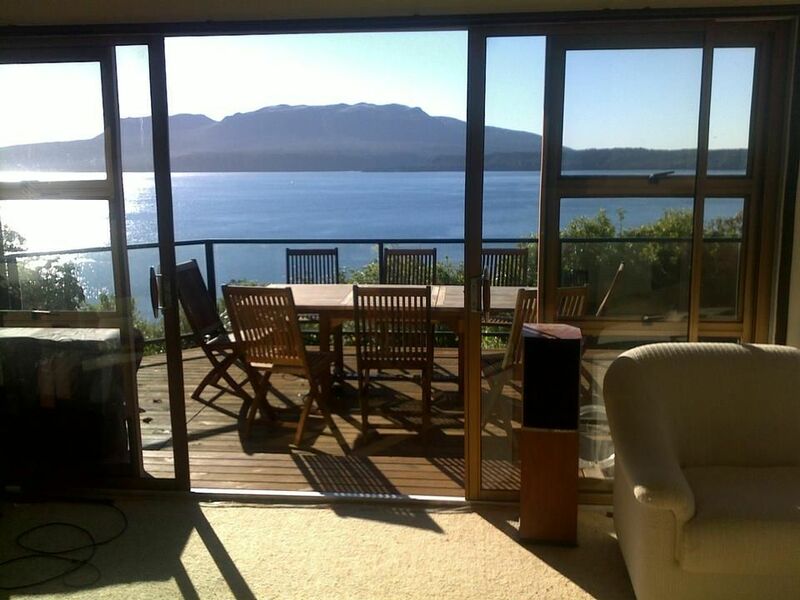 Beautiful 3 brm house and sleeppout at Lake Tarawera with stunning lake and mountain views. Open plans kitchen and dining flows on to lounge and the large deck outside. The large deck overlooks the lake and is well fenced and safe for children. Separate sleepout with double/single bunk bed. Steps walks down to the rear lawn and Te Tora Dr behind the house. The main house has 3 bedrooms, each with a queen size bed. There are spare mattresses for the lounge or the separate sleepout (the sleepout is a simple cabin on the deck). Please note there is a bathroom plus a separate toliet (1.5 bathrooms). The kitchen has been recently renovated and has a dishwasher. The house is equipped with all mod cons. There is a log fire to keep you warm on colder days. The house has parking for 3 or 4 cars. There's additional parking behind the house on Te Tora Dr. You can also park a boat on the driveway, though you will need to shuffle cars or park them on Te Tora Dr. This is house you can really relax in, or enjoy the many activities at the lake or forest areas. Fantastic walks nearby, mountain biking trails, great fishing and swimming in the lake. Only a 15 - 20 min drive to Rotorua's city centre. This is our own little piece of paradise and we would like to share it with others. We have nice neighbours who are lake residents (including the local security company) so please enjoy the house but treat it with common sense and respect. Oh BTW the spa doesn't work, sorry. It's all covered up and unused for years. Min stays - Pls see online booking calendar. An additional $60 cleaning bill also applies for each stay. No smoking please. No pets (sorry). When we go to the lake, all of our everyday stress falls away. Tarawera reminds us life is beautiful. It's a place filled with fond memories, shared with people who matter to us. Walk around the lake or go for a swim. Mountain biking at Redwoods is world class - you can start on Tarawera Rd by the "black house". Rotorua town centre is about 20 mins away - close enough for day visits and far enough to feel you are back amongst tress and birds. Excellent place to relax and unwind with family and friends. Expansive view of lake and Mt Tarawera right in front of the house. Wake up to breakfast with amazing views. Oil column heaters for every room. All mod cons to make holiday meals easy, with dish washer, nespresso coffee machine, fridge/freezer, microwave, toasted sandwich maker and stove/oven. Stock up on coffee capsules at supermarket. Freeview plus TVNZ Ondemand and Lightbox. Large deck with fencing, safe for kids. Large outdoor table with 8 chairs.